Does back pain keep you awake or cause you to toss and turn all night? If you do, you’re not alone. Millions of people suffer from some level of back pain from causes such as strain, poor posture, injury, or another affliction. What if you could find a body pillow that was so comfortable it’s like a dream? It’s possible to fall absolutely in love with the right body pillow that alleviates your back pain and lets you fall asleep and stay asleep all night. Everyone knows that sleeping on your side is often the healthiest and best way to sleep, but when you have back problems like sciatica, ruptured or bulging discs, herniated disc, muscle spasms, spinal arthritis, or spinal stenosis, side-sleeping can trigger back pain. Body pillows are designed to be therapeutic, which prevents these various types of back pain. The following will discuss virtually everything you need to know about body pillows to help you choose the right one for you. 2 What Is a Body Pillow? 3 What Are The Benefits of Using Body Pillows for Back Pain? Choosing a full-body pillow includes factoring in its size, shape, and what materials are used in its construction. Body pillows come in shapes like the ‘U’ shape, some are rectangular, and some resemble an enormous candy cane. Personal preferences such as firm, medium, or soft are part of the selection process as is whether they are made from man-made polyester or organic cotton or wool. If you like the idea of a candy cane shaped body pillow, this is the pillow you want. The Leachbo Snoogle body pillow is one of the top-selling full-body pillows for chronic back and neck pain. It also helps people with digestive issues like acid reflux and respiratory problems. It prevents issues that occur from tossing and turning so you will always have support for your spine and relief from back pain all night. It’s lighter than the Comfort U, but much larger in size. The filling is comfortable, firm, and supportive. Users say that while this pillow is quite large, it fits the average size bed without complaints from their spouse/partner. The Comfort U body pillow is ‘U’ shaped and supports both sides of the body (front and back) for side sleeping. This shape is optimal since you won’t need to shift and move this huge pillow around each time you roll over in bed. It allows you to lie on your side, curl around it, and switch positions with ease while it aligns and supports your spine. The Comfort U body pillow is massive, so it’s fine in a king-sized bed, but in a queen-sized bed, things could get a bit crowded if you have a spouse unless your bed partner wants to use the outer side for support as well. 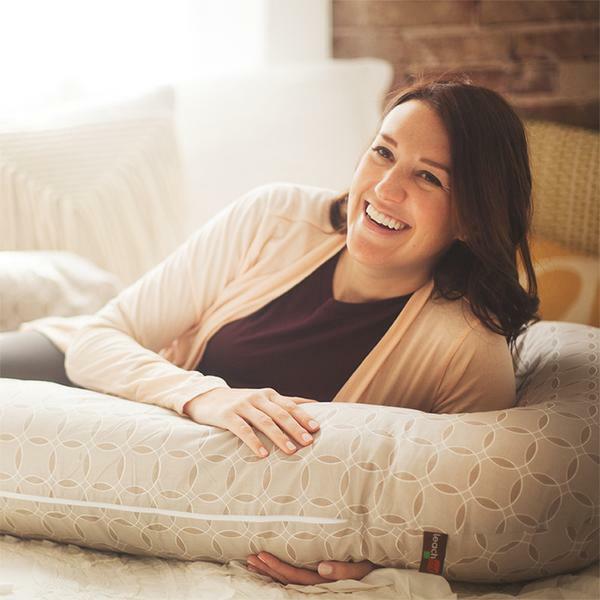 This particular pillow is ideal for pregnant women or nursing mothers as it provides ample full-body support and relieves back pain. Construction – Fusion Foss fill is the premium synthetic fibre used to fill this full-body pillow. It is an extended polymer, which means it allows air to freely flow. It has a cotton cover. If you’re into eating organic foods and reducing toxins in your life, the Holy Lamb organic body pillow is the top choice. Where body pillows are most commonly filled with man-made polyester, this one is filled with pure wool and features an organic cotton sateen cover. Since we spend about one-third of our lives in bed, organic bedding is better than traditional bedding and pillows that are loaded with chemicals and toxins. This full-body pillow features a rectangular shape therefore, it won’t prevent tossing and turning. Although, it will alleviate back pain and fulfil your toxin-free existence. This is the smallest of the three body pillows in this guide. A body pillow is an oversized pillow constructed to promote spinal alignment and provide superior comfort for a restful night’s sleep. This kind of pillow makes it comfortable to sleep on your side and prevents you from sleeping on your stomach, which is the worst sleeping position if you suffer with back pain. What Are The Benefits of Using Body Pillows for Back Pain? These overly long, oversized pillows will become your best friend when you start sleeping through the night and awakening without back pain. Here are the benefits. Full-body support – As you sleep, these lengthy pillows provide you with full-body support, which promotes side sleeping. Place this kind of pillow between your knees to help align your spine and relieves back pain caused by herniated or bulging discs and sciatica. Muscle relaxation – When you sleep in the right position with your body in proper alignment and your weight is essentially evenly distributed, you breathe easier and your blood circulation is more efficient at helping your muscles get fully relaxed. Pregnancy – During pregnancy, back pain is expected. When you’re pregnant, it’s not advised to take certain pain medications or perform certain stretches that help back pain, therefore, a body pillow is the safest recommendation for you. Body pillows are designed to support your back and your baby belly at the same time, allowing you to sleep comfortably throughout the night. The Leachco Snoogle is our number one pick for reducing back pain all night. Sleeping on your side with your legs slightly drawn up to your chest while resting your upper leg on the full-body pillow. The products have pictures that show you the proper sleeping position on body pillows. I need to sleep on my side due to sleep apnea. Right now I’m limited to sleeping on my back only because of pain in thoracic spine. The bulging disc in that part of my back affects my breathing muscles when I sleep on my side and it restricts my breathing for days afterwards. Are any of these pillows able to provide the type of support I need for the thoracic spine? I really need help.